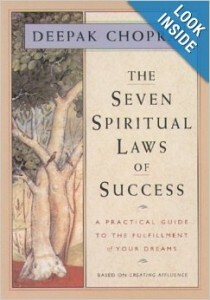 This is a book that has really inspired me a lot so I decided to write the 7 spiritual laws of success summary so that you can get a glimpse of what the book contains if you don’t have it in your collections right now. If you believe in metaphysics like me, then in order to succeed in any part of life I would strongly recommend you this amazing book by Deepak Chopra named “Seven Spiritual Laws of Success “. I have always been a fan of Deepak Chopra and in this book he has written these very important laws that can enable anybody to succeed in his life by getting a deeper understanding of them and for that it is necessary to read it very often..
Now this something that pushes us to achieve our dreams, Deepak Chopra explains “The Law of Pure Potential” and he says that the person who is aware of his true potential is able to achieve anything that he wishes for. Here Deepak says that the soul is free of fear and only a person who is aware of his true potential can reach his goals and for this, it is essential to practice stillness because then only a person can come close to his higher self. In another chapter of this book we come across “The Law of Giving”, this is something that can free any person from the burden of miseries. The author explains in a very easy manner that we can only have what we can give, this teaches us to go with the flow of universal motion by giving what we want to others and universe. We have discussed it in “The Law of Karma” and this is the third law explained in this book. Here the author tells us to become more aware of the thoughts and choices that we make in every moment, he also explains some of our conditioned reflexes and habitual patterns. “ Grass does not try to grow, it just grows. Fish do not try to swim, they just swim. Flowers do not try to bloom, they bloom. Birds do not try to fly, they fly. That is the message of ‘The Law of Least Effort”. What has been explained here is something that we all must understand because this is the common mistake that everyone makes which is “putting in a lot of effort”. With “The Law of Intent and Desire” Deepak enlightens us about the difference between intent and desire. He describes the two states very beautifully, one is when a person just flows by using his energy in a proper way and the other way when he force himself to achieve something, anybody can relate themselves with this chapter as we all have experienced both the states somewhere in our life. Then he comes up with “The Law of Detachment” by which he reminds us that in order to achieve something we should first learn to “set it free” and that is how detachment is practiced. Now, this chapter really has the power to make you think about your purpose in this world, it motivates us to think whether we are utilizing the gifts with which we were born or we are just walking on the path that appeared to be safe? With “The Law of Dharma” Deepak makes us to search for the gifts that we have been blessed with, otherwise we will not able to get a life that we truly deserve. This is a great book to keep with us always in order to get back on track whenever we get diverted from our path.